Are Adult Mini-Trampolines Safe for Young Children? Playing on the playground is an enjoyable childhood activity. Playgrounds provide your child with a chance to get exercise while engaging with her peers. 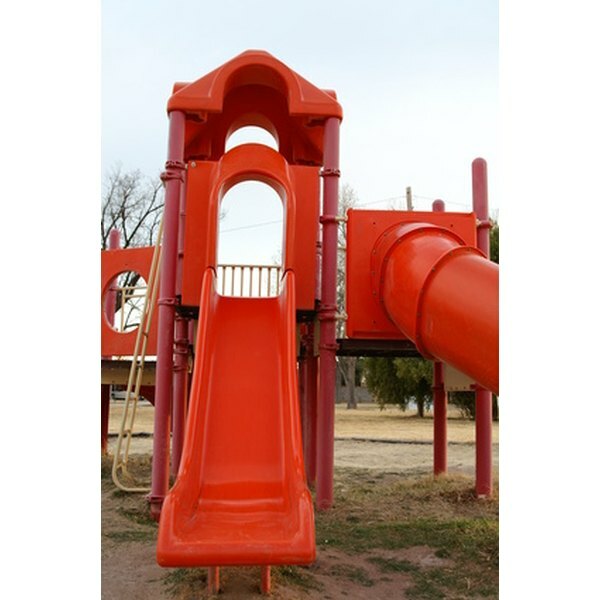 As a parent, it is your job to make sure the playground you take your child to is safe. According to Kids Health, about 220,000 children are treated in emergency rooms each year for playground injuries. Inspect playground equipment for potential hazards, and give your child specific playground safety rules so she can enjoy her play time. Your child should go down the slide feet first in a sitting position, According to Kids Health. Going down head first on the back or the stomach can result in injury. Teach your child to wait until the bottom of the slide is clear of other kids, and to go down one at a time. Your child should not push other children down the slide or allow anyone to push him down. Healthy Children adds that you should show your child how to test the slide to make sure it is not too hot. Kids Health reports that swings contribute the highest number of childhood injuries on moving playground equipment. Using swings correctly can help reduce the chance your child will get hurt. Teach your child to sit on the swing rather than standing or kneeling. Tell your child to hold onto the chains of the swing tightly, using both hands. Kids should not jump off of the swing while it is moving. Children should swing one at a time and walk around moving swings so they do not get kicked, adds Healthy Children. There are many different types of climbing equipment, and teaching your child some basic rules can help keep him safe on any playground. Teach your child to wait until all other children are off the climbing structure to go up or down, recommends Kids Health. Make sure your child knows to climb up and down using both hands and feet, and not to jump from the equipment to the ground. Your child should know not push other children on climbing structures as well. See-saws are safe if they are used properly by children who are old enough. Younger children should only play on see-saws that have springs to prevent the equipment from slamming into the ground, says Kids Health. Healthy Children adds that older children can play safely on see-saws when both sides of the see-saw have approximately the same number of children weighing about the same. Teach your child to sit in her seat facing forward and to hold onto the handles tightly with both hands. Show your child how to keep her feet from going under the see-saw to help prevent her feet and ankles from being crushed.